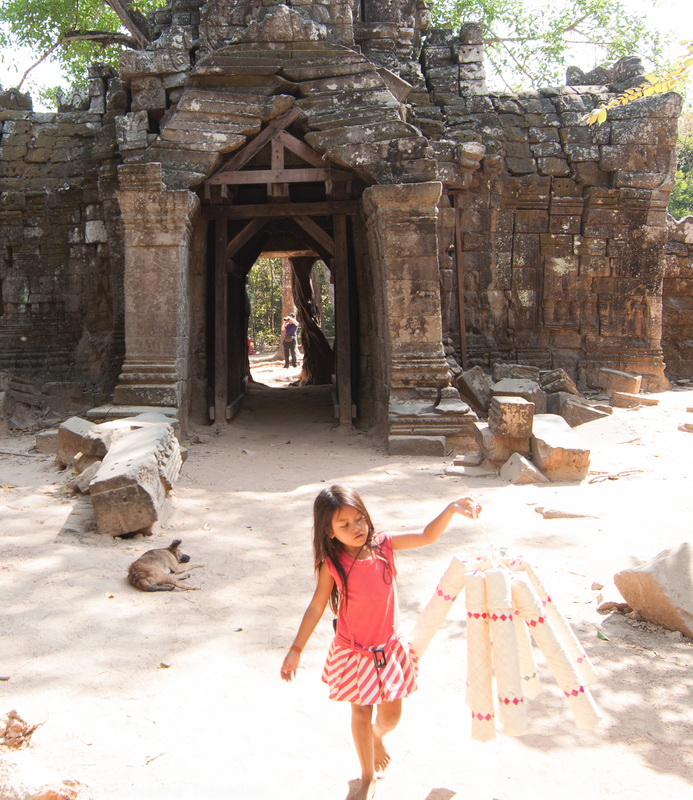 All over Southeast Asia you will encounter this in tourist areas, but in Angkor Wat it is even part of the travel guide book folklore: children working as hawkers, selling you food, drinks, trinkets and other souvenirs. Some local tourist information use an euphemism saying that you will be glad that someone will sell you a cold drink in the heat of the day. Interesting way of promoting child labour. Street hawking by children is not an easy topic. It never is easy when it comes to developing countries and the effects of poverty getting in contact with members of a richer society. Many such situations go against our general moral tuning. On the first thought of course child working as a hawker is a very bad thing for a child. And it really is, no one wants his own child to work so early losing the innocent time of childhood we cherish so much. But then think deeper about the unsolved issue of everyone in developing countries to have as many children as possible. Who are we to stop others to have the children they want – impose birth control like in China? And what would those children born into this poor part of the world do if they are not selling goods to you? If you think about it, many of us also sell goods, only later in life! Don’t forget that you need money for education, not everyone is so lucky to have free universal education system like in most western countries. Not long ago, that wasn’t even the case – there was also no school obligation for kids in Europe! If those children in developing countries wouldn’t work as street hawkers, they may end up in the darker parts of the street where you don’t want children to be. They might be sniffing cheap glue to escape from the cruel reality, taking other types of narcotics or being exploited in human trafficking. There are many NGOs out there to help the children of Cambodia, some more professionally led, others less, but most of them with the intention to help. Although often only doctoring at symptoms and being the virtual drop of water on the hot stone it is better than nothing at all. Besides children, which are the most effective sellers when they are young and cute, you can find many more pesky people while walking on the street of developing countries: beggars, low quality music players, yelling tuktuk drivers looking for business and many more. As you walk down the street as an obvious tourist you cannot avoid to be hassled and it is very difficult to concentrate on enjoying your environment while being busy blocking all the interferences from touters. It sounds all very bad and annoying when you try to enjoy yourself. But never forget that people are much poorer then you and me who are fortunate that we grew up in a fully developed country enjoying all those things other people have never seen. Which one of those options overcoming their poverty would you prefer to encounter? In case 1., 2. and 3. you lose involuntarily. In case 4. they need your consent to get your money. Finally in case 5. and 6. you even get something in exchange for your money. As much as beggars, touters and honking tuktuk drivers are annoying, at least they do not steal or rob your money. Surely there is also the problem that beggars in some countries maim themselves, i.e. cutting their hands off voluntarily/ getting their feet cut off involuntarily, to be more effective. Obviously their income as beggars rise significantly if they are short of a body part. But this is something on the very extreme. As for Cambodia, there are many war invalids with a real claim of suffering, so they do not need to mutilate themselves. On a more positive note, tourism is restributing global wealth, so you are actually helping developing countries by spending your money there. On the other side is a doubled edged sword in the sense that too much tourism can prevent a country to develop other types of industries and services as most human capacity is then bound by the tourism industry. But this is a different topic, which we leave for another day. Despite possible negative sides, in the end conscious, sustainable tourism is not only an economic subsidy of poorer countries but also opens the mind, extends the own horizon, helps develop other countries and improves intercultural communications. Reblogged this on The Mundane Traveller.